January 23, 2019 -- His Holiness The Dalai Lama, revered world leader of Tibetan Buddhism and the Tibetan people, has endorsed plans by the Houston-area Mahatma Gandhi Library and its partners to build and operate the privately funded Eternal Gandhi Museum in Houston. The multi-media museum, a tribute to the influential life and just causes of Mahatma Gandhi, is set for completion in 2020. The letter by The Dalai Lama, winner of the Nobel Peace Prize in 1989, is here (.pdf). 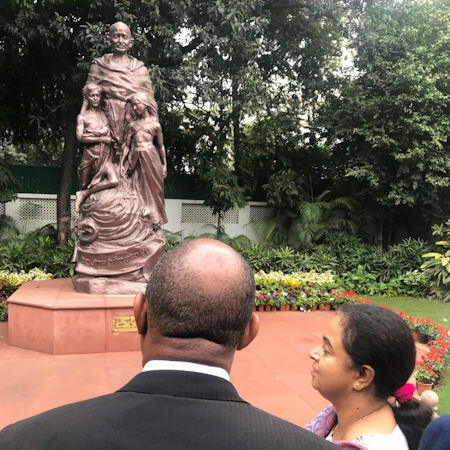 Mayor Sylvester Turner visited Rajghat, the Gandhi Memorial in New Delhi, during the Greater Houston Partnership trade mission he led to India in November. (See photo below). The mayor related the Eternal Gandhi Museum project in Houston to his visit to Gandhi’s living quarters and the garden where Gandhi, an influential force for non-violent social change and India’s independence, was assassinated on Jan. 30, 1948. The Houston project has raised $2.25 million toward its goal of $8.5 million.